A casual white dress paired with a light jacket and wedge sandals could possibly be the perfect combo for a beautiful spring day! I love that the blossoms are now in full bloom and that each morning when I take Dasher boy on a walk, we can hear the birds singing (Dasher boy especially loves the birds, he tries to chase/catch them but doesn’t even come close ;). What’s your favorite spring time outfit combo? Oh my, the blossoms are breathtaking! Beautiful outfit! Those shoes are just to die for! I love those shoes, gotta have them! This outfit is BEAUTIFUL on you!! You are such a beautiful pregnant woman!!! Cute outfit and the pictures are gorgeous! Such a gorgeous look for spring! I love the denim jacket paired with the white dress! SO pretty! I love this outfit! Perfect for spring! This is such a pretty spring/summer look Rach! I love the light wash jean jacket paired with this white dress. It’s becoming a staple this year. Totally gorgeous! Looove the blossoms! So pretty! Love your wedges! 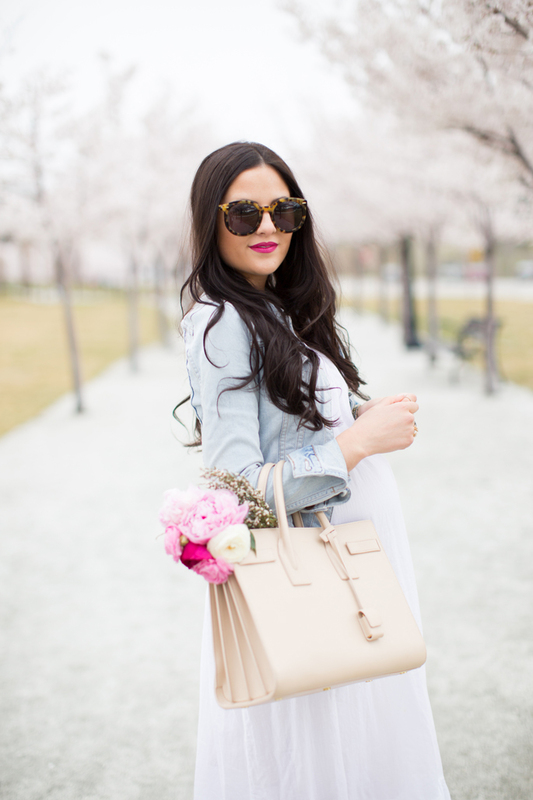 I love lighter denim for spring! love spring perfect! absolutely gorgeous! Love this cute spring look! The wedge heels and jeans jacket are perfect! Love the blooms! So pretty! That dress is beautiful, and I’m love the cherry blossoms!! Loving your white dress with all of the spring blossoms, so pretty! Love the cherry blossoms in the background! This casual look is perfect! That is such a pretty white dress, it looks adorable paired with a denim jacket. I cannot wait for spring to start blooming in ny! You are glowing!!! Super cute and romantic!!! Gorgeous look!! I swear, you can never beat the look of a white dress and a jean jacket. I like that your jean j. is a lighter wash – my old Levi’s one is a bit too dark…time to get on board with the fade!! Beautiful shots! I love that white flowy dress and those wedges look super comfy! You look stunning! I love how effortless this look is! I’ve been seeing white dresses EVERYWHERE. It really makes me want a new one. . . or maybe I should just bring out my old one. Love this look! I really love your shoes! The dress goes perfectly with the blooms in the background. Stunning! Such a gorgeous summer outfit! Sooo in love with this look, the wedges are gorgeous! What a super cute look! I love the jean jacket with that dress! You look beautiful! I’m loving the white dress for spring! Lovely look! Living in Florida, spring is short and summers are HOT! So, light cotton dresses and tanks are always on my go to list. I also love carrying a denim jacket, even in the summer because air conditioning is always on high gear everywhere! Lastly, you’ll cringe, but flip flops and sandals are my (and every Floridian’s) go to pair of shoes in the spring and summer months. It’s just so hot! I’m shopping for summer flip flops right now, lol. Hope you have a wonderful spring day! This Is a gorgeous outfit! That dress looks so pretty on you! BATTLE OF THE BOXES and be featured! So happy to see that spring has arrived for you! I am curious if you are using a sunless tanning product? It looks like you have a bit of a tan, but is so super natural! Thanks! LOVE this blog post! Your outfit and accessories are perfect!!! LOVE the flowers too! You get more gorgeous by the day. Love this look! 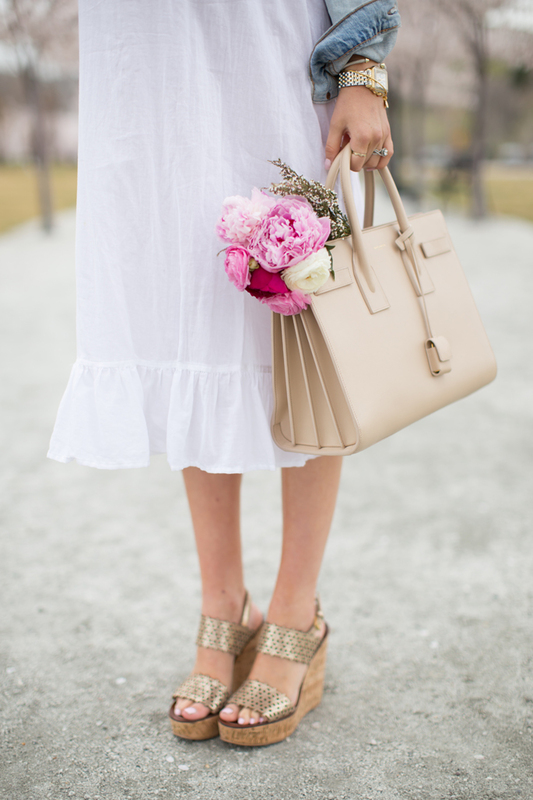 perfect spring look — love the dress. When are you due? You look enchanting in this outfit! Beautiful photos! My Favorite Spring time outfit combo is my jean jacket and mint cords! I absolutely love anything pastel for spring! These pictures are gorgeous! Love your outfit! Darling look! I love the soft flowy dress with the jean jacket! Oh I love a fresh Spring outfit! And I love the location of these photos I actually just recently took pics here LOL Have a lovely day. You look stunning as usual. This combination looks soooo great for you!!!!!! I can’t wait for the cherry blossoms to bloom here! Makes me so happy that the sign for summer is coming! ahhh i love this path!!! soo beautiful! you are glowing rach! Such a beautiful setting. You look fab pregnant, Rach!! Gorgeous look! Love the denim jacket, must buy one for this spring! LOVE that jacket with the dress!!! Now this is a great outfit. Best look you’ve put together since you got preg Rachel. Awesome job! Loving this gorgeous look on you! Perfect for spring and summer! and that bag is seriously to die for, love it! P.S. think you would love our Girls Night Out Look that we shared on the blog today! Your sandals are super cute and I love your white dress! It’s this kind of style that makes me love your blog so much! The white and denim combo is beautiful. Love this outfit!! Those wedges are so cute! I love this combination, this dress is so lovely. Such a beautiful outfit and location! Would you mind sharing your nail color? It is the perfect neutral with a hit of pink! Thanks! This is the perfect combination for a spring day!! I love the length of the white dress. The wedges are perfect! And I’m loving denim jackets lately! The perfect finishing layer for a casual chic look. These pictures with the blossoms in bloom are absolutely stunning! You are radiant in this pics, Rach! Finally, it is so refreshing to see you in something so feminine, ethereal, soft that really showcases your pregnancy instead of those too tight dresses and skirts that just don’t look right. This is absolutely gorgeous!! Great job! lovely!!! the outfit and scenery! So romantic and feminine! Love it! Amazing outfit! I love the shoes!! Such a great look – so feminine and beautiful! So beautiful!! Really love this post! It’s been a little while since I didn’t come around here, and I missed your posts and your outfits actually ! You’re still so beautiful and so perfectly dressed ! Love the casual chic yet feminine look of this Spring outfit! Especially adore the white dress, such a pretty piece! Wow what beautiful pictures! Those trees really make you feel like spring is here! Your pregnancy style is so on point! Hope I’m that cute when I am pregnant! Thanks for the post! I love this look & I will definitely wear something similar asap! I also really love your blog! You’ve inspired me to start my own style/shopping blog in partnership with my mom :-). It’s only been about a month, but we’re already having so much fun with it! I would reeeally appreciate it if you could please check out our blog & follow us on Bloglovin’ & Twitter ;-)! Great outfit — love the shoes. They are amazing. You look lovely.